With the Merge gaming network’s new European gaming license in place, one of their flagship sites, Lock Poker, has just “locked up” two of the top poker players in the UK as the newest members of Team LockPro ELITE: Chris “Moorman1” Moorman and Nicky “Cod Meharly” Evans. Moorman is coming off a terrific 2011 World Series of Poker which saw the young pro bank over $1 million in prize-money, and currently ranks in the Top 5 on the WSOP Player of the Year leader-board. Moorman is no stranger to online sponsorships having been part of the Brunson 10 at Doyles Room in the past; not surprising considering his lifetime earnings for live and online tournaments exceeds $7 million! Moorman has made a smooth transition to live poker, evidenced not only by his 2011 WSOP, but also a final table appearance at the 2011 Aussie Millions Main Event. 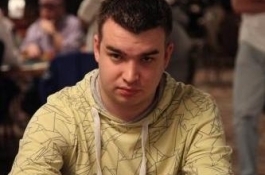 Add this to his online accomplishments, which include an unbelievable 11 PocketFives Triple Crowns in addition to being a perennial candidate for Online Player of the Year, and it becomes fairly obvious that Moorman is one of the top players in the game. Evans’s resume is not quite as extensive as Moorman’s, but the young pro has only been playing poker for about 5 years, and is already nearing the $1 million mark in career earnings. Moorman and Evans will join other LockPro ELITE members such as Jose “Girah” Macedo, Eric Lynch, Matt Stout, Stevie Devlin, Casey “BigDogPckt%s” Jarzabek, and Brett “Gank” Jungblut. This entry was posted on Saturday, July 23rd, 2011 at 9:47 am and is filed under Poker News. You can follow any responses to this entry through the RSS 2.0 feed. You can leave a response, or trackback from your own site.